When designing features to help reduce flooding, some architects think in terms of what they call sponges and barriers: features that keep the water out or temporarily absorb it. Although the basic principles of architectural design don’t change, there are many out-of-the-box ways to apply them to manage flooding in individual neighborhoods, like using empty lots as greenways to break up long stretches of pavement in Huntersville. Montgomery is an architecture student and member of the Sea Level Rise Program at Hampton University and a Virginia Sea Grant Future Resilience Leader. 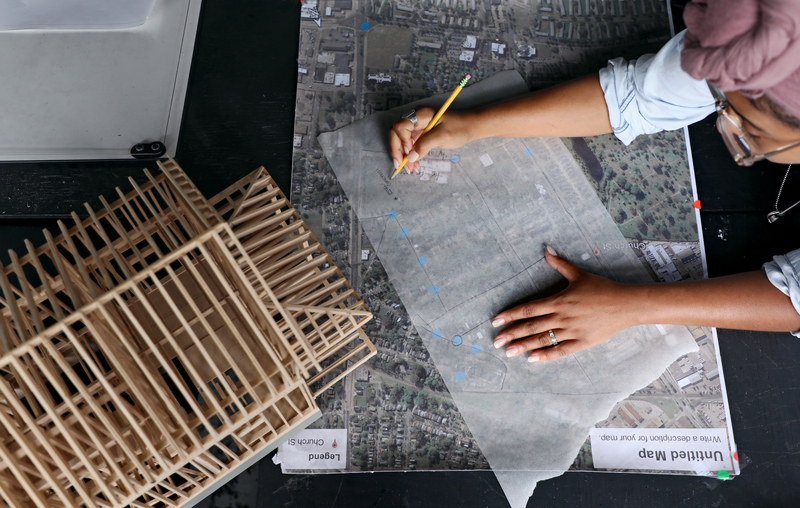 She’s one of the leaders of the Coastal Community Design Collaborative (CCDC), a group of student architects, engineers, and marine biologists that develop innovative designs to help Hampton Roads neighborhoods deal with flooding. During the 2017-2018 school year, the CCDC partnered with the neighborhood of Huntersville to come up with new ways to address recurrent flooding. They designed a variety of options, such as installing a wetlands area near a creek bed that floods and planning greenways to break up long stretches of concrete and absorb water. They also designed an urban farm building to collect and use rainwater, while also providing the neighborhood with fresh produce they were lacking after their community garden shut down. The farm building would collect rainwater in rain barrels and send it through a filtration system to irrigate the plants growing in the building. This blend of creativity and feasibility is a key result of the collaboration between engineers and architects. Each person’s unique perspective contributes to the different project ideas for each neighborhood. Huntersville is the fifth neighborhood the CCDC has worked with since its inception in 2012. Since the beginning, the collaborative has consisted of an interdisciplinary team: Hampton University architecture and marine biology students, Old Dominion University civil and environmental engineering students, plus a number of professional mentors and consultants. "We believe firmly that no one has all the answers, so we spend a lot of time relying on our friends with knowledge in one area or another,” says Mason Andrews, an associate professor of architecture at Hampton University. “The more voices get heard, the better the results." Montgomery also emphasized the importance of talking with the community throughout the project. The community residents provided information about where flooding occurs that might not be evident based only on looking at maps, and they also raise other concerns that can be addressed at the same time as flooding, such as parking shortages. Then CCDC group meets once a week throughout the year to brainstorm ideas and flesh out different designs. No two projects are exactly alike—each neighborhood has its own unique features to consider. In an artsy area like the ViBe creative district in Virginia Beach, this takes the form of performance areas that double as dry swales to absorb floodwater. In Huntersville, where residents were concerned about high-speed traffic, this takes the form of inverse speed bumps that can slow cars and store storm water. Even though not all the projects designed by the collaborative have been constructed in the neighborhoods, the group sparks ideas that might not otherwise come up in discussions with city officials. With many different minds working together in cooperation with communities, the collaborative offers thoughtful designs that are ready to be implemented as soon as funding allows. “That’s an important thing, because we’re in the boat we’re in, so we all need to get our paddles in the water working together,” Andrews says. Collaborations of architects, engineers, and marine science students design solutions for flood management that are creative, feasible, and environmentally friendly. The flooding solutions are tailored to the unique needs and organization of each neighborhood.